Happy New Year! As we prepare to begin a new year of movie-going, it's time to take a look back on some of the better films of 2014. This is a list of the films I enjoyed, not necessarily a Top Ten Best Films of 2014 list (some of the prestige films like Selma didn't open in Baltimore until after the new year). For this list, I chose the ten films of 2014 that entertained me the most. Big Hero 6 – Disney hit one out of the park in the animation department, something usually reserved for their sibling company Pixar. But this tale of teenaged superheroes scored major points for introducing the world to Baymax, a medical droid who becomes pivotal in saving the world (or at least the fictional city of San Fransokyo) from destruction, and for injecting real heart-tugging emotion into the story. When children and adults are sniffling and wiping away tears, you know the filmmakers have done their job. Dawn of the Planet of the Apes – Rise of the Planet of the Apes was better than it had any right to be, and with its combination of popcorn entertainment and amazing CGI characters and performances, a sequel was inevitable. Dawn, which takes place ten years after Rise, takes the performance capture and CGI to whole new levels (Andy Serkis really should be considered for an Oscar nomination as the ape Caesar) and takes the story to another, more thoughtful level as well. The film really sets out to make you think about our society and the directions we could go if we're not careful, and that's something you don't usually get from a summer SPFX blockbuster. It loses a few points for some of the much too stereotypical human characters, but overall it really whets your appetite for the next chapter. X-Men: Days of Future Past – This is the film X-Men fans have been waiting for, the one that merges the key players from the original trilogy with the new cast from the most recent film. X-Men: First Class was a triumph in the way it showed us the younger versions of Charles Xavier/Professor X and Erik Lensherr/Magneto and other future X-Men and how the plot tied into the history of 1962. The new film also plays with the past, present and future using Hugh Jackman's Wolverine as the connective tissue, and even when it gets a little goofy towards the end, it's still hugely entertaining and shows that there's still plenty of life left in the franchise (unlike Sony's Spider-Man). Captain America: The Winter Soldier – The first Captain America film was a real gamble, setting the main part of the story in the 1940s and bringing Cap to the present right at the very end. The new film was also interesting in that, while it has a modern setting, the tone is very 1970s political thriller like The Parallax View and Three Days of the Condor. To strengthen this narrative, Marvel even went so far as to cast Condor star Robert Redford in a pivotal role as a top dog at S.H.I.E.L.D. The film even touched on a government's over-reach into personal privacy, something that Cap is against, and will continue to resonate through to the next Avengers and third Captain America movie. It was all brilliantly realized and a little CGI-heavy at the end, but still one of the best of the Marvel superhero flicks to date. Into the Woods – Disney took a bold step in making a film based on fairy tales … but this isn't your traditional Disney fairy tale movie. Stephen Sondheim's Broadway musical finally made it to the big screen, and for an adaptation it really works. The actors acquit themselves well handling Sondheim's complicated lyrics, and director Rob Marshall works his magic as the film goes from the bright, color tales that we (think we) know to a much darker place where "happily ever after" really is just a fairy tale. It's definitely not for little kids, and a downer of an ending may color how you feel about the film as a whole, but I enjoyed it immensely. Marvel's Guardians of the Galaxy – Captain America: The Winter Soldier was the best Marvel film of the year … until this one came out a few months later. Marvel gambled hard on bringing a little-known cast of comic book characters to the big screen, but with director James Gunn's obvious affection for the material and a star-making performance from Chris Pratt, the gamble paid off. It was also one of the few summer blockbusters that wasn't a sequel or reboot, and proved that if the studios can produce a great movie that can make people talk, they can have a hit with original material. The film was great fun with a great 1980s mix tape soundtrack and some eye-popping visual effects and makeup. Definitely one of the most enjoyable films of the year. Edge of Tomorrow – I'm still baffled as to why this tanked at the box office, but it's obvious the studio had no idea how to market the movie, changing the title from the source material's All You Need Is Kill to a more generic Edge of Tomorrow, and they still don't know how to promote it on home video, hiding the title in the smallest font possible and using the film's tagline "Live. Die. Repeat." as the title. The film is a clever Groundhog Day story of a man who has to re-live the same day over and over again in order to fight an alien invasion of earth. Terrific performances from Tom Cruise and Emily Blunt (who is getting notice for her Into the Woods role), some amazing action scenes and an ending that will keep you guessing should have had people lined up to see this. They didn't, and they missed one of the most exciting films of the year. Pride – Pride tells the story of a group of gay men and lesbians who started a group to help support British miners during a strike which shut down the country under Thatcher's rule in the early 1980s. Picking a small mining town to deliver their donation, they faced some resistance but were also welcomed by many in the town. The situation is one of those things that can only happen in the movies, but this is a true story! The film doesn't hold back in showing the fight for gay rights of the time (and touches on the beginnings of the AIDS crisis), both in London and in the small town, but it's ultimately an uplifting, emotional, funny, triumphant story that never becomes sugar-coated. There are also some great performances from Imelda Staunton, Ben Schnetzer and Jessica Gunning, all worthy of awards consideration. The only misstep now is the US home video packaging that has completed erased any mention of the gays. For a movie about acceptance, it's shameful that Sony felt they had to whitewash the video package to sell a few more copies (although it would be fun to sit with some unsuspecting viewer in the Bible Belt while the story unfolds). Birdman – This is one of those movies that just puts your jaw on the floor for the entire running time. Michael Keaton stars as a washed-up actor, who once played the superhero Birdman (wink, wink), trying to get his star to rise once again by mounting a Broadway play … something he's never done before. As the production and his psyche spiral out of control, we're taken on the ride in what appears to be one continuous shot (even though it takes place over the course of several days). With ironic performances from Keaton and Edward Norton, and wonderful support from Emma Stone, Naomi Watts, Zach Galifiniakis and Andrea Riseborough, Birdman is one of those films that just stays with you long after you've left the theater. A definite Oscar contender for Best Picture, Birdman could be this year's Gravity. 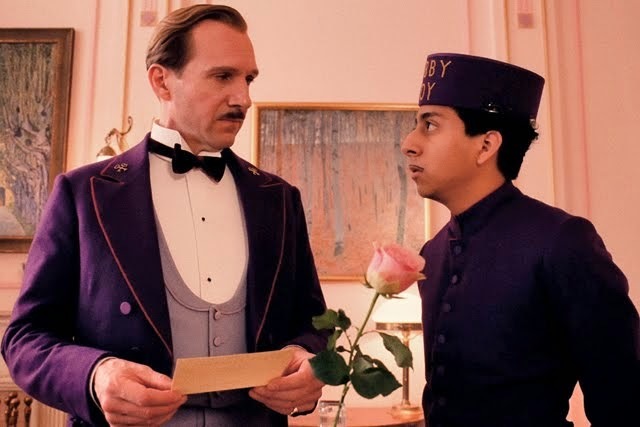 The Grand Budapest Hotel – When this finally came out in March, we had already endured two months of lackluster films like The Legend of Hercules, At Middleton, That Awkward Moment and The Monuments Men, so Wes Anderson's twisted tale of romance and (possible) murder was a welcome respite from the winter dreck. I'm not even a fan of Anderson's films and I found this to be utterly charming from beginning to end, with Anderson's whimsical visuals firmly grounded by a bravura performance from Ralph Fiennes as the hotel bellman who keeps things running while attending to his own needs. The film becomes a caper when a painting goes missing, and then a jail-break movie, almost veering into Pink Panther-like slapstick before settling back at the hotel and a poignant ending. Incredibly enjoyable from beginning to end, and definitely a contender for Oscar gold. If you missed any of these movies in theaters, you can still find Into the Woods and Big Hero 6 on the big screen. The rest are currently available on home video. Do check them out!